Someone awakening from a 50-year coma around the time that Justice Anthony Kennedy announced his retirement from the U.S. Supreme Court might have mistakenly come to the conclusion -- had he or she listened to the admonitory speeches of Senate Democratic Leader Chuck Schumer -- that efforts were being launched across the United States to legally require women to conceive, or not conceive, children. Schumer repeatedly warned of an imminent attack on what he called the "reproductive rights" of women. 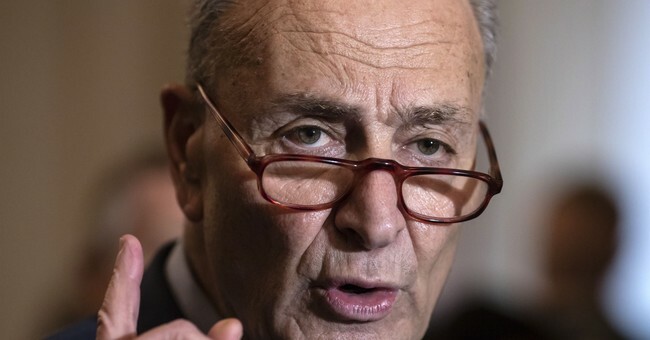 "We recently received news that Justice Anthony Kennedy will be retiring, leaving a vacancy on the nation's highest court," Schumer said on the Senate floor on June 27, the day Kennedy announced his retirement. "This is the most important Supreme Court vacancy for this country in at least a generation," Schumer said. "Nothing less than the fate of our health care system, reproductive rights for women and countless other protections for middle-class Americans are at stake." After President Donald Trump nominated Judge Brett Kavanaugh to replace Kennedy, Schumer returned to the floor to make the point again. "In selecting Judge Kavanaugh," Schumer said, "President Trump did exactly what he said he would do on the campaign trail: nominate someone who will overturn women's reproductive rights and strike down health care protections for millions of Americans, including those with preexisting conditions." "Judge Kavanaugh got the nomination not because he will be an impartial judge on behalf of all Americans," Schumer said, "but because he passed President Trump's litmus tests: repeal women's freedom for their reproductive rights and repeal America's health care, including protection for preexisting conditions." When Kavanaugh's nomination finally came up for a vote last week, Democratic Sen. Robert Menendez of New Jersey echoed Schumer's rhetoric in explaining why he would vote no. Menendez had to stop the attack on "reproductive rights." "My daughter has grown up never knowing what it was to live in a country where women were denied reproductive rights," Menendez said. "Now I fear my granddaughter may grow up never knowing what it was like to live in a country where women had reproductive rights." But is it plausible that Justice Kavanaugh may vote on the Supreme Court to advance some sort of legal framework that denies women the right to have as many children as they wish -- or forces them to conceive children against their will? Americans who have not been in a coma for the last 50 years know that when politicians like Chuck Schumer or Robert Menendez use the term "reproductive rights," they are not talking about the right to reproduce. They are talking about a claimed "right" to kill an unborn child. But because politicians like Schumer and Menendez apparently do not believe they can win an unambiguous debate on whether there is, in fact, a "right" to kill an unborn child, they use the term "reproductive rights" as a euphemistic substitute. This is the classic fallacy of mistaking the question, which can always be rebutted by pointing to the real question -- and forcing deniers to confront it. The state of Iowa is doing precisely this in defending the right of life. Earlier this year, Iowa Gov. Kim Reynolds signed the "heartbeat bill," which prohibits physicians in that state from aborting an unborn child if the child has detectable heartbeat. "I believe that all innocent life is precious and sacred, and as governor, I pledged to do everything in my power to protect it," Reynolds said when she signed the law. "I understand that not everyone will agree with this decision," she said. "But if death is determined when a heart stops beating, then doesn't a beating heart indicate life? For me, it is immoral to stop an innocent beating heart." "I understand and anticipate that this will likely be challenged in court, and that courts may even put a hold on the law until it reaches the Supreme Court," she said. "However, this is bigger than just a law. This is about life. I am not going to back down from who I am or what I believe in." Planned Parenthood of the Heartland sued to stop this Iowa law -- stating in its complaint that detectable "fetal cardiac tones" (n.b. a heartbeat) occur "as early as six weeks" into pregnancy. An Iowa court issued an injunction to delay the law's enforcement while the case is under consideration. In the federal Congress, Republican Rep. Steve King of Iowa has introduced The Heartbeat Protection Act. It would prohibit physicians nationwide from aborting an unborn child with a detectable heartbeat. King's bill has 173 co-sponsors. The Republican-controlled House of Representatives should pass this bill and send it to the Republican-controlled Senate. If Chuck Schumer wants to block it with a filibuster, let him try. Make him stand on the Senate floor day after day -- as he did in the Kavanaugh fight -- and defend not "reproductive rights" but killing a baby with a beating heart. Schumer may have the heart to do that, but does he have the guts?